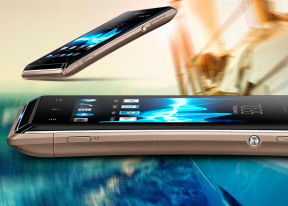 The Sony Xperia E dual comes with the proprietary Sony image gallery, dubbed Album. Images are organized into stacks of thumbnails and sorted by date. You can opt to show all of your albums in one place, and there are three tabs above the stacks - Pictures, Map and Online. Pictures is the main tab and one of its features managed to impress us: you can use pinch gestures to make the image thumbnails bigger or smaller. The whole thing is super responsive and hundreds of thumbs fall in and out of differently sized grids with very smooth transitions. Map reminds us of the iOS gallery, where all geotagged pictures are shown on a world map. The Online tab displays pictures from Google Picasa and Facebook. You have options to tag, like and comment on Facebook photos much like you did in the previous Xperia Gallery. The video player is dubbed Movies and it too has a new interface. It's connected to Gracenote, which helps you find additional information about the movies you have on board. The Xperia E dual video player handles most of the common formats - it played all DivX, XviD and MP4 videos up to WVGA resolution. MKV files, the AC3 audio codec and subtitles are not supported though. Despite that it did far better than we expected and we are really glad about that. Nicely done! Another of the redesigned Sony media apps which received a facelift with Sony's arrival at ICS is the new Walkman music player. It retains all the functionality of the older music players but adds a little bit extra here and there. It is divided into Playing and My music panels. In the My music section, you can update your album art and music information like album, year released, and more. SensMe is included, meaning you can filter your songs by mood - upbeat, energetic, mellow, dance, etc. Creating playlists is enabled and you can also view your Facebook friends' activity if they too use the Walkman player. The Now Playing screen offers the standard music controls, shortcuts to the library, "Infinity" key and song cover art. The Infinity key lets you quickly look up a song on YouTube or browse for the lyrics, among others. Sony has improved on the Walkman player's settings. There's Surround sound mode, which imitates the Studio, Club or Concert Hall experience, while Clear Stereo mode enhances the perceivable stereo channel separation. The xLOUD enhancement for increasing the loudness of the internal speaker is here too. 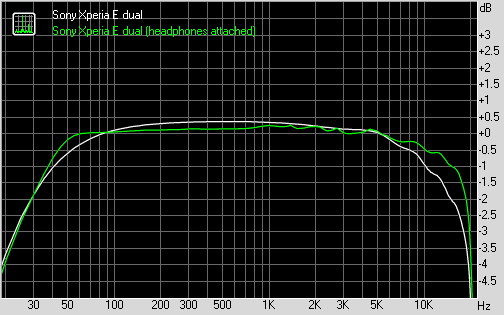 And audio fans will also be pleased to find a configurable 5-band equalizer with bass adjustment. However die-hard audiophiles might prefer additional players, which sport 10-band or even 20-band equalizers. There are music controls on the lockscreen. Swiping them to either side brings back the clock. The notification area also offers the now playing screen with music controls and the option to jump into the Walkman player app. The Sony Xperia E dual also features an FM Radio aboard complete with RDS support. The app automatically seeks and adds bookmarks to stations in range, although you'll need to have a set of headphones attached to use as an antenna. The Sony Xperia E dual failed to impress in our audio quality test, posting some pretty mediocre results in both parts. When connected to an active external amplifier the Xperia E dual got only average scores for noise levels and dynamic range, while its frequency response left a lot to be desired. The volume levels were pretty poor, too, so the overall performance is rather disappointing here. The good news is there's little degradation when headphones come into play. Stereo crosstalk rises does take a hit and distortion levels rise, but the frequency response, noise levels and dynamic range actually improve slightly. Unfortunately the volume levels are even lower here and given that even the improved scores are far from perfect, we'd suggest audiophile keep away from this one.